It seems as though if you have an animation playing that would “beat” a level when a timer runs out (such as candy moving to the score keeper or the shell exploding), then it doesn’t count that towards your victory. This happened to me during my first play on both the top and middle tracks and was very annoying. It was especially annoying when the shell was 90% exploded (as in the blocks were flying apart but hadn’t yet faded) but I was told that I failed. Yes… the case of the orb being exploded but you still failing is unacceptable. I’ll see what I can do to fix it. Also, it should be possible to leave a level early when it becomes clear that you cannot win given your current timer. 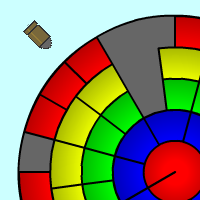 This is especially the case on some of the center “destruction” track levels where hitting a chocolate can mean defeat even with 20 seconds or more still on the clock. This would be so much better with if there was a way to lock the mouse on the play area. Whenever the mouse pointer leaves the play area, the rotation stops, which is very frustrating. I was about to say what guy just said. A restart or leave button is nearly necessary on some levels. Ditto the “restart/quit level” button. Waiting around after knowing you’ve failed is bothersome. Wonderful game! I absolutely love how you repurpose the mechanics for the 3 campaigns. As for suggestions, I agree that a reset button and mouse locking would be very handy. It would also be good if you could grab and spin the candy from any point.